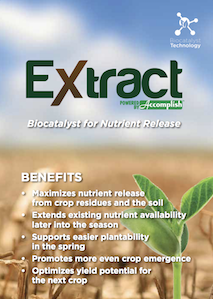 Extract Powered by Accomplish™ (Extract PBA) (6-0-0-13S) is an innovative biocatalyst specifically formulated to maximize nutrient release. Used as a pre-emerge or residue application, Extract PBA combines the concentrated biochemistry of Accomplish® LM with ammonium thiosulfate (ATS) to help growers access the full nutrient value of their fertilizer investments. Learn how the proven technology in Extract PBA helps growers get more out of their crop fertility programs.